Ian Kinsler became the career leader in stolen bases among Jewish players Monday night (7/22/2013) with his 163rd theft in 200 attempts (box score). The 31-year-old Texas Ranger drew a first-inning walk off of New York Yankees pitcher Ivan Nova, promptly stole second off of catcher Chris Stewart, and then scored on a single by Adrian Beltre. The steal nudged Kinsler ahead of retired slugger Shawn Green, who dropped to 2nd on the career leader list (see below). Kinsler climbed the career leader list with relative efficiency, reaching the top spot in his 8th MLB season (compared to Green’s 15th), his 4,502th plate appearance (Green had 7,963), and his 200th attempted steal (Green attempted 214), giving him a success rate of 81.5 percent (Green’s was an admirable 75.7 percent) . Although there is video of Kinsler stealing his record-tying 162nd base — he tied the record on July 13 — MLB.com did not post video of the 163rd theft. 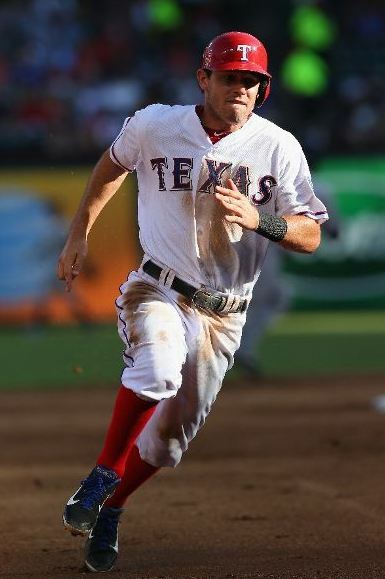 By coincidence, Kinsler’s 162nd stolen base made him the Texas Rangers’ career leader. Kinsler had attempted to steal his 162nd base on July 8 against former teammate (and fellow Jew) Scott Feldman, but Orioles catcher Matt Wieters tossed him out. The Arizona State alum had spent a month on the disabled list earlier this season.